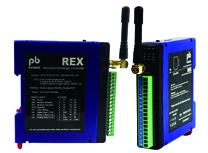 REX is engineered to do remote access and use of mobile technology like SMS in real time fault and alarm notifications. It can integrate with any third party sensor and equipment via dry contact or 4-20mA interface. REX is easy to use yet it is packed with powerful features to meet a wide range of industrial and commercial applications.